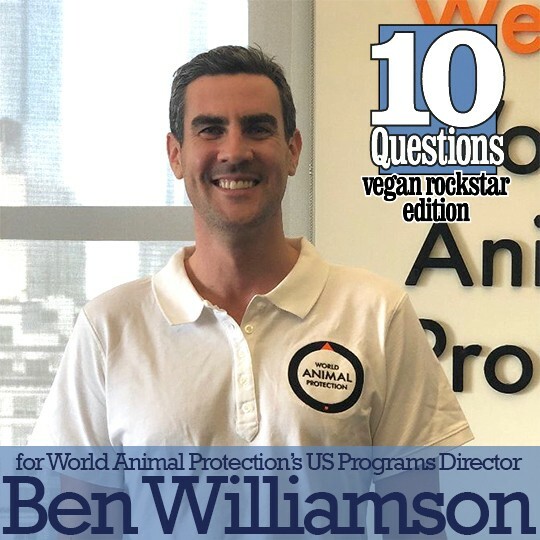 10 Questions: Vegan Rockstar with Ben Williamson of World Animal Protection U.S.
Today, we are happy to feature Ben Williamson, U.S. Programs Director for World Animal Protection US. World Animal Protection, formerly World Society for the Protection of Animals, is a global animal protection organization that works at grassroots and policy levels to create a more compassionate world. From efforts to protect animals locally to global initiatives (you can see there work here), World Animal Protection is dedicated to creating a world with less needless violence and suffering. Please consider following the World Animal Protection on Facebook and Twitter as well as sign up on their website to receive updates on what is happening around the globe and how you can aid in their live-saving efforts. 1. First of all, we’d love to hear your “vegan evolution” story. How did you start out? Did you have any early influences or experiences as a young person that in retrospect helped to pave your path? I went vegan nearly a decade ago. I was raised vegetarian but at age 24, I decided that going vegan was something easy that I could do that would be hugely beneficial to the planet, to my health and to the thousands of animals who would be saved. I was reading many books about ethics at the time, trying to decide the right way for someone, like me, to live. Gary Francione was my earliest vegan influence and I listened to all the Abolitionist Approach podcasts. 2. Imagine that you are pre-vegan again: how could someone have talked to you and what could they have said or shown you that could have been the most effective way to have a positive influence on you moving toward veganism? I believe people are generally good in nature and they want to do the right thing. If I had known earlier how much suffering the meat industry causes, I would have become vegan earlier. Factory farming is the single largest cause of animal cruelty in the world. That’s why World Animal Protection brings change and demands businesses improve the lives of animals in their supply chains. We also educate the public on the extent of animal cruelty caused by factory farms, as well as the health and environmental problems they cause in order to change behavior. We invite consumers to join us in demanding change and provide public information on how they can help, including how much a difference reducing meat consumption makes. We strive to end factory farming and provide people with facts to advocate for behavior change. 3. What have you found to be the most effective way to communicate your message as a vegan? For example, humor, passion, images, etc.? Having spoken to hundreds of new vegans, I don’t think that there’s a one size fits all strategy. Some people are more impressed by facts while others are more sensitive to the emotional pull. I’d encourage people to advocate in whatever way feels natural to them. I like to use humor and patience because that’s what feels most sincere to me. 4. What do you think are the biggest strengths of the vegan movement? The vegan movement is full of passionate people who are so willing to help others transition into veganism. It’s like joining a club. Plus, people who advocate on behalf of animals are usually the same people advocating on behalf of humans and I think we need to express that more often. 5. What do you think are our biggest hindrances to getting the word out effectively? I think some people are so put off by the idea of going vegan that they shut down to all pro-animal messaging. We must understand that it’s a big step for some people, so encouraging them and educating them about reducing their meat and dairy consumption may help more animals in the long run. 6. Why do you promote animal welfare as opposed to veganism? 7. Who are the people and what are the books, films, websites and organizations that have had the greatest influence on your veganism and your continuing evolution? A few of my personal favorites are Peter Singer’s Animal Liberation, Cowspiracy and Forks over Knives, which cover the environmental and health bases. The Reducetarian and Effective Altruism movements have helped me become more of a pragmatist and see these important issues from another angle. 8. Burn-out is so common among vegans: what do you do to unwind, recharge and inspire yourself? I cycle, play and watch soccer, and love to walk. I go to a lot of museums and watch documentaries and trash television to give my brain a break. 9. What is the issue nearest and dearest to your heart that you would like others to know more about? The illegal wildlife trade is the 4th most lucrative transnational crime in the world, following drugs, arms and human trafficking. The annual value of the global wildlife trade is $30-$43 billion, where a significant proportion are live wild animals traded as exotic pets. But whether captively bred or caught from the wild, the exotic pet trade is cruel and causes lifelong suffering of animals. That’s why World Animal Protection launched its recent campaign to fight against this issue, persuaded companies involved in the trade to take action and is educating the general public to shift perceptions and reduce demand for exotic pets. A journey, not a destination. Marla Rose is a Chicago-area writer and co-founder of VeganStreet.com, Vegan Street Media and Chicago VeganMania.